If children love hot dogs, pizzas, chocolates and cola, surely their goddess too will like these. That’s exactly the thought behind these unusual offerings made by devotees at the temple here of Jivantika Mata, a goddess of children, according to the Hindu scriptural text Skanda Purana. Rajkot (Gujarat), Aug 14 (IANS) — This principal city of Gujarat’s Saurashtra region has the only temple dedicated to Jivantika Mata. Gujarati devotees from the state and abroad visit the temple and make large offerings when their wish is fulfilled. “When they ask us what they should offer, we suggest anything that children like to eat, which means pizzas, hot dogs, burgers… even soft drinks,” Aimprasad J. Dave, the temple’s keeper, told IANS. The goddess is offered chocolates and peppermints daily, apart from fanciful fast food. The traditional prohibition against the use of garlic and onions in food, common in most parts of Gujarat, does not apply here, Aimprasad said. The offerings are later distributed among children in the neighbourhood and in slums. Dave’s family has been devoted to Jivantika Mata for the past four generations and spreads awareness about the goddess. It was his father, Ambelal Dave, who built a small temple inside his house and installed the goddess’ idol there 38 years ago. A retired railway employee, Ambelal built the temple from his savings and the family continues with the tradition of not accepting any charity for its upkeep. 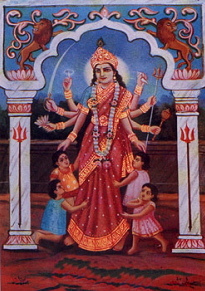 Aimprasad, who works with an insurance firm, has been working to create more awareness about the goddess by travelling abroad and by putting up a website dedicated to her – www.jivantikaadyasthan.com. As more and more people come to know about Jivantika Mata, described as a provider, protector and benefactor of children, many women in the state are visiting the temple to carry out the ritualistic vrat of the goddess. Childless couples or parents of sick children too make a beeline to the temple. “Non-resident Indians also come to do darshan in good numbers. And the goddess is mother to all, so it is not only to fulfil a child-related wish that they come here,” Aimprasad said. To serve the increasing flow of devotees, the Dave family has built a pick-up point near the city’s main bus stand, for which local authorities provided land free of cost. A majority of visitors make token financial contributions that are used by the Dave family for charitable purposes. The family’s donations to the local cancer hospital are used to treat one patient at a time free of charge. On auspicious days, children visiting the temple are served special dinners from these funds since they are seen as representatives of the goddess, Aimprasad said.